Udaipur –As part of the International Teachers Day celebration, VivekanadaLokManch presented “MeraShikshak, MeraGaurav” – “My Teacher, My Pride”. The event was held on 3rd September 2018 at MaharanaKumbhaSangeetParishad, Udaipur. The Guest of Honour for the event was PavanKaushik, Vice President & Head – Corporate Communication of Hindustan Zinc. The program paid tribute and respect to elderly teachers who have dedicated their lives into teaching and imparting knowledge and wisdom. 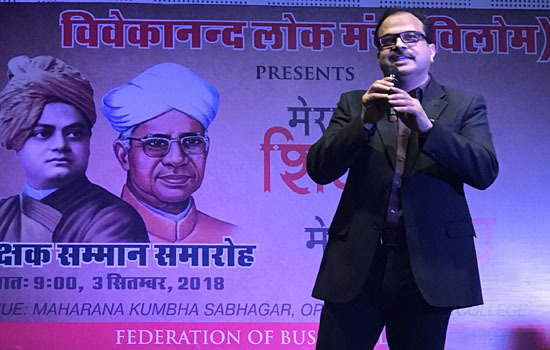 Highly acclaimed senior teachers, teaching across various schools and colleges of Udaipur were felicitated in the event.PavanKaushik spoke about the difference between today’s generation and the previous generations in terms of learning and seeking knowledge. He said “During olden days, the motive behind teaching and learning was to gain knowledge and wisdom. We had so much time back in the day to contemplate, interpret and build our imagination. We were not in a hurry and had time to learn, play and grow. But, today technology and gadgets have replaced our time and attention. Even though man has invented machine, today it is the machines running the man”.He added, “Our teachers are the reason why we are, what we are. Their incessant dedication in building us as a brand has made us successful today. So, never forget your teachers…”. PavanKaushik, also the founder of the project – “Gurukshetra”, enlightened the audience with the importance of setting both long term and short terms visions as a teacher and as a school. He said “Each subject should be considered as an individual vertical. If a corporate structure can be put in place in the schools, it will help devise various verticals of different subjects and with focused teaching, the scoring of each of the verticals can be improved. This would ultimately help in a comprehensive marked improvement in all the subjects taught in the school and would also create a healthy evaluation criterion between schools. With this, schools will see immense success when they develop and run independent verticals that will help in providing an overall grooming for the students and teachers…”.